5. "THERE WILL NEVER BE ANOTHER YOU"
~ Saxophone led Jazz Trio's and Quartets ~ Specializing in Swing and Bossa Nova music. And our reviews speak for themselves ... Let the Nova Jazz Band elevate your event. Nova Jazz is a perfect addition for any occasion. Nova Jazz will provide graceful accompaniment for your Wedding, Private Party or Corporate Event. Specializing in Swing music from the golden era of Jazz, the 20's, 30's and 40's as well as the sweet sounds of Bossa Nova, Latin Jazz and New Orleans Brass Bands, Nova Jazz consistently earns rave reviews from its impressive list of clients including Apple, Google and Gap Inc. as well as from scores of satisfied wedding couples. We would be honored to be of service to you. Nova Jazz performed at our Networking Cocktail Reception on 9/24/2013 for the Prime Minister of Malaysia. They did an amazing job! They were extremely professional and played beautifully. They arrived on time, setup quickly, and dressed professionally. They did not try to play over the crowd or be in the center of attention. Overall, they gave a 5 star performance for our very high profile event. The Aspire Company was extremely impressed and will definitely be booking Nova Jazz for future events. It was an honor and a privilege to work with you guys. Thanks Jamie! Nova Jazz, and the Daniel Heffez were absolutely EXCELLENT! Daniel Heffez, band lead, was so easy to work with and saved our butts when our original choice for wedding ceremony and cocktail hours Jazz Quartet backed out on us a few months into the wedding planning. Daniel Heffez (Nova Jazz) confidently and with ease calmed our nerves and assured us that they would not cancel on us, as the first Jazz vendor did, and he did not disappoint. I would recommend Nova Jazz to for any event. also, they are scalable to your needs in terms of instruments desired and # of musicians/components desired for your event. Nova Jazz delivered us a quartet that was honestly the easiest and most mailable vendor that served our wedding! thank you Daniel and the Nova Jazz band members for an amazing memorable component to our wedding day. best regards, Scott D.
Nova Jazz is the BEST!! I honestly cannot say enough good things about Daniel and the Nova Jazz band! I hired them to play during my company's holiday party, during the cocktail hour, and they blew it out of the water. The music that they selected to play was the perfect element for our Mardi Gras theme. Everyone was raving throughout the night about the music and how it set the tone for the entire evening. I look forward to booking them again for future events! Great performance, would highly recommend! Daniel and his group performed for several hours at a mixer event for our property management company. They did a really great job and we were all impressed by their sound. I would recommend them to anyone looking for a great jazz trio! Nova Jazz is the Best! We booked Nova Jazz for my 50th birthday party, and we are so happy we did. Daniel worked with me from the very beginning helping to create the perfect sound for my Madmen themed party. He took the time to understand the exact sound I wanted and he and the guys were able to bring that vision to life. If I didn't know better I would have thought Dave Brubeck was playing, that's how good they sound. I would recommend them for any event. Daniel was hired as a solo saxophonist for my recent wedding ceremony and cocktail hour. He was so professional and played my song selections so beautifully. My now husband said he spoke to Daniel before the ceremony started and said that Daniel made him feel so at ease. I highly recommend him. Daniel came early and introduced himself immediately. He and the musicians were consummate professionals, setting the exact mood we were looking for. We would definitely hire them again. Daniel and the band were fantastic, really great music enjoyed by all- upbeat and moody: it really set the scene for our event. I hired Nova Jazz for an event a few weeks back. They were perfect for our small outdoor occasion and very easy to work with. They played a great combination of older and newer material, played at the perfect volume (not too loud) and were very professional. Highly recommended! Although we are from the east coast (NY), our daughter lives in San Francisco and recently got married there. She hired, ( we paid) a wonderful jazz band called the Nova Jazz Trio to perform at the wedding. I must say we were very impressed at the quality of music played and the professionalism they exhibited. They sounded great and they really made the wedding the wonderful event that it was. My parents were celebrating their 30th wedding anniversary so we wanted to hire a Jazz band as my father loves jazz. I posted a message on Yelp for suggestions and got plenty of referrals. The Nova Jazz Band, was mentioned by a few different people so we hired them. Needless to say, my father was ecstatic. The Band was wonderful! They played many of the standards people recognized and they were just very pleasant and really cool. They were very accommodating ( they were available on short notice), professional and their rates seemed reasonable for a 3 hour performance. There is nothing but positive things to say about Nova Jazz. They showed up on time, looked fabulous and were the highlight of the event! I couldn't be happier with their performance and ability to keep a large crown delighted for hours. If you are looking for a spectacular Jazz performance at your next event, I highly recommend Nova Jazz without any hesitation. Daniel was a pleasure to work with from beginning to end. He was responsive and reliable. He made a 1.5 hr. drive on his own time to view the event venue and address any potential logistical issues. Unfortunately, the weather did not cooperate for my event, and we were forced to make some last-minute changes, which Daniel rolled with. He and his band pulled off a very quick transition between the reception and dinner locations with subtlety and grace. Above all, they were consummate, talented musicians who provided top-notch entertainment that the guests enjoyed them very much. I would highly recommend Nova Jazz and am always on the lookout for an opportunity to work with them again. They arrived early, looked great and played so very well for our diverse and attentive crowd. They played a mix of music that had the whole room feeling warm and romantic. Thank You Daniel and Nova Jazz for an absolutely splendid evening! Nova Jazz has a wonderful sound and range in repertoire. The guests at our celebration raved about their performance. We loved the music. Also, Daniel worked with us on the music and accommodated our request for a vocalist rather late in the planning process. The band was punctual and professional. Five stars all 'round. Great band to work with! The band was communicative before the event, on time, professional and played wonderfully. Everyone at our company event was impressed with the music. I'd use them again in a heartbeat. Wonderful group to work with. Daniel and his team were a pleasure to work with, punctual, and flexible to the needs of the event-what a success! A wonderful addition to our party! The Nova Jazz band were an amazing addition to our party! We wanted wonderful music for our cocktail and dinner party. The music was not overpowering but complemented the atmosphere. We chose a trio, but could add more instruments/musicians if that is what we wanted. They were easy to book and a pleasure to work with. The entire experience was professional and a treat for us. They sounded great and you could tell that they have a high level of musical expertise. What more could you ask for. North Beach Brass -- excellent! Highly recommend the North Beach Brass Band. Daniel was very helpful throughout the booking process, and the band was stellar on the night of our event! The 6-piece brass group played a variety of New Orleans classics and ended the night with a "When the Saints" march through our event. Lots of energy, great sound. 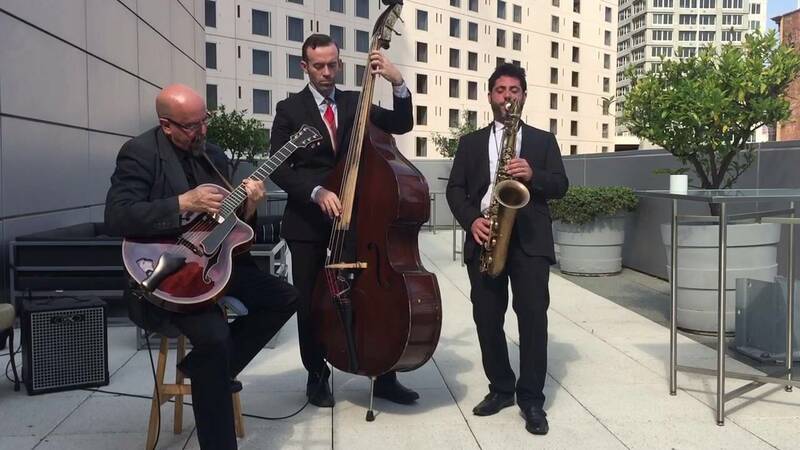 Sophisticated and elegant - Nova Jazz played at our Wedding Show event and we couldn't be more than pleased. Their choice of music and style completely matched our event and I wouldn't hesitate to recommend them to our clients. Nova jazz did our shop wonders! Professional talented band! They setup early and started their set on time. Wonderful gentlemen who were an absolute pleasure to host. Would love to have them perform again! Nova Jazz Band was a great band to have at our wedding reception. Daniel was very informative and helpful in arranging what type of service we needed and the pricing was great. Everyone raved about the excellent music, they showed up early to get set up and were very quiet and seamless when breaking down their equipment. We would definitely recommend them to anyone in need of a great Jazz band for a wedding or otherwise, they really know how to get the occasion started! Adventurous music, great fun and very professional. I hired Nova Jazz to play for a surprise party for my husband's 30th birthday. They were excellent. The music was lively and it set the mood for a night of celebration. Everyone had a great time. Moreover, Daniel and his band were very professional, simply a pleasure. I would hire them again for another event. Highly recommended. Nova Jazz brought some great music and a super fun attitude and vibe. I love these guys! 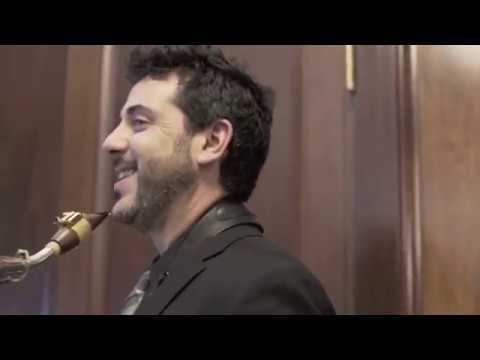 I hired Nova Jazz for a wedding I was designing and planning and right off the bat, my clients loved Daniel. He had an ease about him and was knowledgeable when we met. Nova Jazz delivered exactly what my clients wanted which made them very happy. Everyone was on time, professional, and personable. Nova Jazz was Perfect for our Wedding. We hired Nova Jazz to play background music at our wedding reception. The band created an upbeat atmosphere during guest arrival and dinner. The band was professional and pleasant. I highly recommend Nova Jazz for your event. 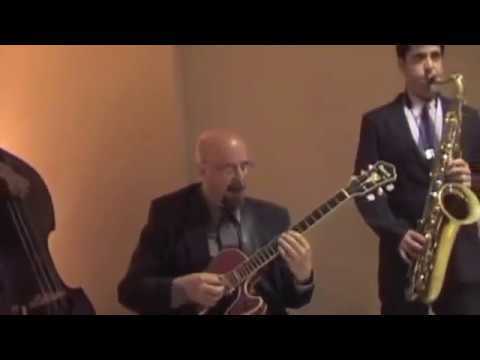 Nova Jazz played at my wedding reception a few years ago. They were great, well-priced, and totally adaptable about outdoor conditions. Room to a Read, a SF nonprofit which builds schools and libraries in developing countries, holds an annual fundraiser. We were looking for a great band that could play at our event and Nova Jazz was it! The members of Nova Jazz are very professional and worked with us to plan exactly what we needed for the event. The most important part - the crowd loved them!! I love that they dress the part and enjoy what they do. They always provide great energy to my events. I hired Nova Jazz for two separate events. The first was for a small intimate wedding where they played the cocktail hour and evening entertainment. I was impressed with the professionalism and courtesy provided to guests as well as the volume of the music. Not too loud! :) I also was impressed with their repertoire and music selection. I also hired them for a larger corporate event which was about 200 people. They were on time, prepared and equally professional. They had people dancing, and were played a great variety of tunes appropriate for this event. I would hire them again in a minute because they are reliable, easy to deal with and able to adjust their music according to the type of event. Their rates are also very reasonable! Nova Jazz was the highlight of our party! Nova Jazz was the highlight of our party. They were on-time, professional, well dressed and well rehearsed. Not only were they easy to work with – they are incredibly talented musicians and made our event a shining success. They were able to play a range of songs to please our diverse group of guests, and were gracious and accommodating to our special song requests. Nova Jazz helped us create the mood we were hoping for and more. I would not hesitate to recommend them to anyone who is looking to make their event special. We plan to arrive between 30 - 45 minutes prior to the beginning of the scheduled performance to set-up instruments and go over any last minute details with the client. We always start at the scheduled time and generally perform continuously for 50 - 60 minutes, after which we take a 10 minute break. We always take recommendations and are very flexible in our repertoire. If no musical recommendations are made, we will create a playlist that suits the mood of the event. We dress the part and always look sharp. Prior to the performance, we are always able to connect through cell phone, text or email. 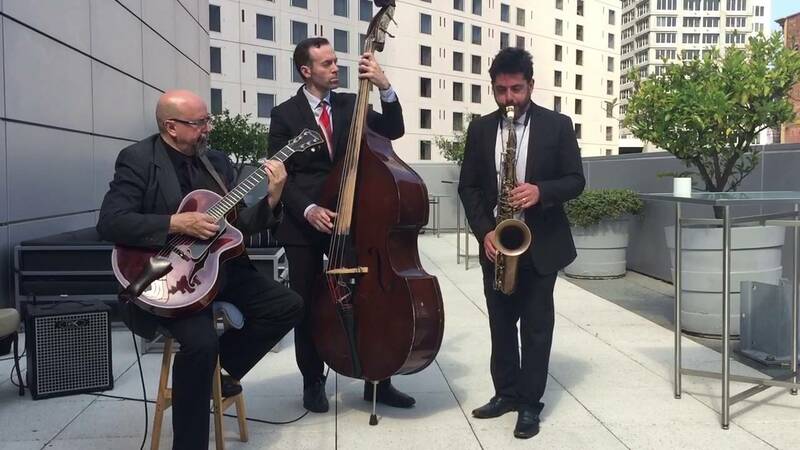 Consistently rated as one of San Francisco's top jazz bands, Nova Jazz is the perfect addition for any occasion. Nova Jazz will provide graceful accompaniment for your Wedding, Private Party or Corporate Event. Specializing in Swing music from the golden era of Jazz, the 20's, 30's and 40's as well as the sweet sounds of Bossa Nova, Latin Jazz and New Orleans Brass Bands, Nova Jazz consistently earns rave reviews from its impressive list of clients including Apple, Google and Gap Inc. as well as from scores of satisfied wedding couples. We would be honored to be of service to you and promise to delight your guests for any and all occasion. 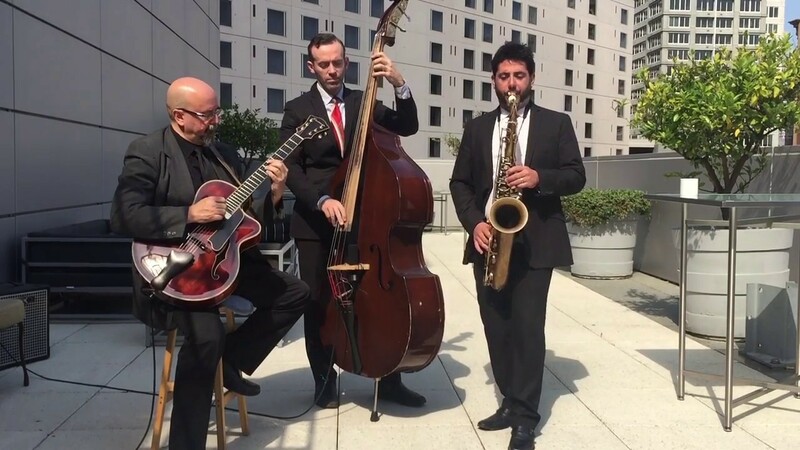 Nova Jazz can be customized for any occasion to play as a trio which includes saxophone, upright bass and piano or guitar, or as a quartet with the addition of drums to bring added excitement and dance-ability to any party. Soloists & Vocalists are also available. Nova Jazz has played venues in and around San Francisco, Napa, Mendocino, Santa Barbara, Reno Nevada and beyond. We are able to play various styles of jazz to custom-tailor the mood of your event.